In an interview with Wii’s World, Brian Provinciano from Vblank Entertainment talks about his newly released title Retro City Rampage, the 8-bit sandbox adventure parody game infused with industry references and tropes of modern game design. He would also talk about his working with Nintendo, and what he plans to do afterwards. According to Provinciano, Retro City Rampage took him 6 years of development time with numerous hospital visits for overwork symptoms that he is still recovering from. Creating the game was mostly a one-man operation, and a large chunk of time was spent on business, PR, producing, and marketing prior to development, and during distribution. On the development side, the game is wholly experimental and reflexive, as Provinciano had actively tinkered with real 8-bit hardware, and based the visual designs on games he has played from childhood, including suggestions from those who valued the game’s nostalgia factor. We can see in the trailer that Retro City Rampage included numerous references to every familiar game on the Nintendo Entertainment System platform under a Grand Theft Auto-esque design. Provinciano explains that the open-world design was “the perfect medium to bring just about any idea to life and have all of the ideas seamlessly flow from one to the next”. Likening it to sculpting, he talks about how this design allowed to help him find advantages in balancing to seamlessly blend story world, mission objectives, and plot progression altogether. Am I seeing a Ninja Turtles level right now? Nintendo’s been great to work with, everyone there. Dan Adelman’s a champ and works incredibly hard to help Indies and deserves a lot of recognition, and on the European side, Christian, Oliver and Pepe were just as supportive, to name a few. The pleasant experience working with them on a personal level is the primary reason why I’ll continue to make games for Nintendo platforms. 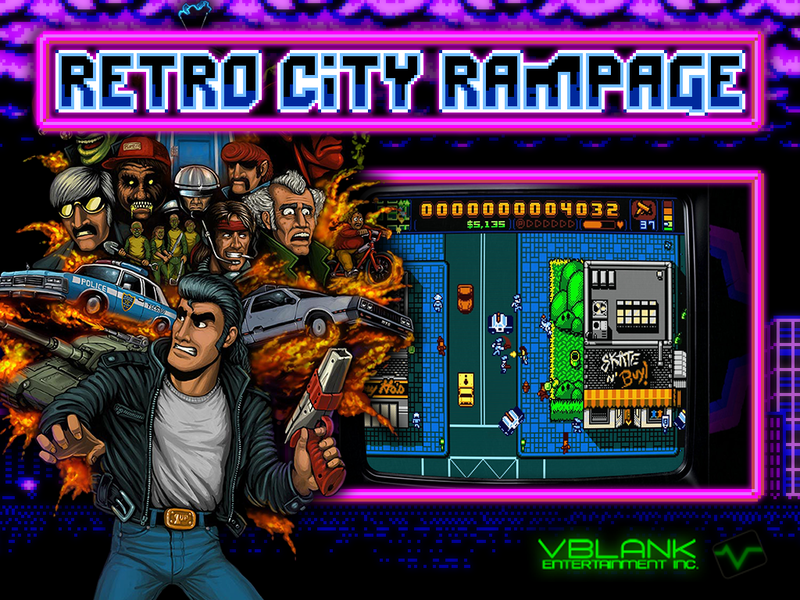 Fortunately for Nintendo-platform owners, Vblank has shown some favor with Nintendo upon the WiiWare release for Retro City Rampage, and expects more games for Nintendo platforms in the future. While this sounds good, indie-developers face great difficulty in making ambitious games in a risk-averse industry. So supporting games like this one always helps for any development studio or publishing company. Retro City Rampage looks to be a very fine game, and it should cater to anyone with an itch for retro-gaming, or for those who like self-aware sensibilities in their games. Check out our review of the game through PSN. Andy was a member at Operation Rainfall since the beginning of its campaigning days. Though something of a troublemaker at the time, he now contributes to Operation Rainfall and shares his love for all things gaming and the visual arts. His favorite games include Xenoblade Chronicles, Kid Icarus Uprising, and No More Heroes. Andy currently holds a Bachelors degree in Cinema, which he uses to pursue filmmaking.